BBC NEWS | UK | Magazine | Who is P O'Neill? The two-sentence statement from the IRA, announcing that it had disposed of its arms, ended with an enigma: Who exactly is P O'Neill of the Irish Republican Publicity Bureau, Dublin, the name that appears at the end of IRA statements? Given the well-documented history of the Irish republican movement's leadership during the past 30 years, P O'Neill is probably nobody but a committee, perhaps the so-called "Army Council" of seven leading republicans. But the use of the name on scores of IRA public statements, which have sought to justify the movement's armed conflict, poses a question: just how does a supposedly secret organisation communicate with the outside world? In the early days of the 20th century republican movement, everybody knew who they were. The men who led the 1916 Dublin uprising signed the declaration of independence - and in doing so most of them signed their death warrants. When violence came to the streets of Northern Ireland, and the Provisional IRA emerged at the turn of the 1970s, journalists could interview leading republicans, including one Martin McGuinness MP - not least because most of them believed it was going to be a short conflict. But that all changed as the conflict became entrenched. The IRA reorganised into a clandestine paramilitary operation, its membership went underground, and the need for publicity became more important. One of the first signs of this new publicity were the "Brownie" letters. In the mid-1970s, Gerry Adams, now Sinn Fein president, was among the republican internees at Long Kesh, the camp later turned into the Maze prison. These smuggled letters, published in Republican News/An Phoblacht, depicted life inside. "My name? No, I won't put my name to it," he wrote in the first appearance. "You'd take an awful reddner [blushing face] in here over the name up in print. I'll settle for a pen name - how does Brownie grab you?" The emerging republican leadership were putting their thoughts to the public - but they would do so while maintaining a façade of secrecy. Danny Morrison, who became Sinn Fein's publicity chief in the late 1970s, was given the job of focusing political debate for the party through the pages of Republican News - and developing a propaganda war against the state. "We were held back at first because in the late 1970s the real crisis was what was starting to happen in the H-Blocks [the battle over political rights for paramilitary prisoners]," says Mr Morrison, now a writer and a commentator. "The media at the time did not realise how much effort we had to put in to those campaigns and protests. "There were very few public faces of Sinn Fein at that time," he says. "I for instance would have been introduced to a newly arrived journalist under a false name. It was only after people were put up in court, flushed out, that we thought, we could exploit this for a public profile." 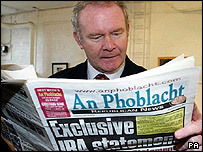 To opponents of republicanism, however, Sinn Fein's publicists were nothing more than apologists for terrorism, who used slick PR techniques to disguise the true nature of the movement. Furthermore many people saw in the IRA's use of the P O'Neill nom de guerre an attempt to romanticise the organisation. Kris Brown of Belfast's Linen Hall Library is responsible for managing an enormous and unique archive of political material that charts the publicity and propaganda war. The collection runs to hundreds of thousands of documents. "We often think of the protests and radical disturbances as being driven by television," says Dr Brown. "But many of the most influential groups [during the Troubles] were quite small and fell back on self-publishing because they had no access to the mainstream media. "They were producing their leaflets and other material from above pubs, in community centres and distributing it any way they could." These restrictions led to some novel tactics. In Derry, IRA sympathisers launched a Christmas postal service, complete with its own stamps, for instance. Loyalist groups also began self-publishing, developing some fairly sophisticated periodicals pushing their particular cause and politics. Dr Brown says charting the development of this material is vital to understanding the history of the conflict. But one thing we may never know is the origins of P O'Neill. There's no clear evidence of the name's birth in the Linen Hall Library papers - and even the former Sinn Fein publicity director says he doesn't know. 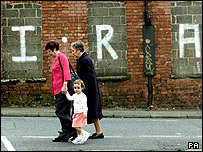 "In the early days [the 1920s] individual IRA commanders used to sign statements," says Danny Morrison. "I'm fairly sure that the name S O'Neill was used in Belfast in the 1940s, but I don't think we know the exact provenance of P O'Neill." There is, of course, one final stack of papers that may have the answer. It's the archivist's dream to see the inner workings of a secret organisation - and the papers that Dr Kris Brown would be delighted to add one day to the Linen Hall Library's collections are the IRA's own internal documents. "I think the last thing to be decommissioned will be the IRA's internal documents," he says. "There has to be paperwork, but I would presume it's not on a large scale and kept very secure for obvious reasons. "If we do get to see it, it will probably only be a private donation - decades from now." Got a question about the news? Maybe Who, What, Why? can help. Send the Magazine your question using the form below.